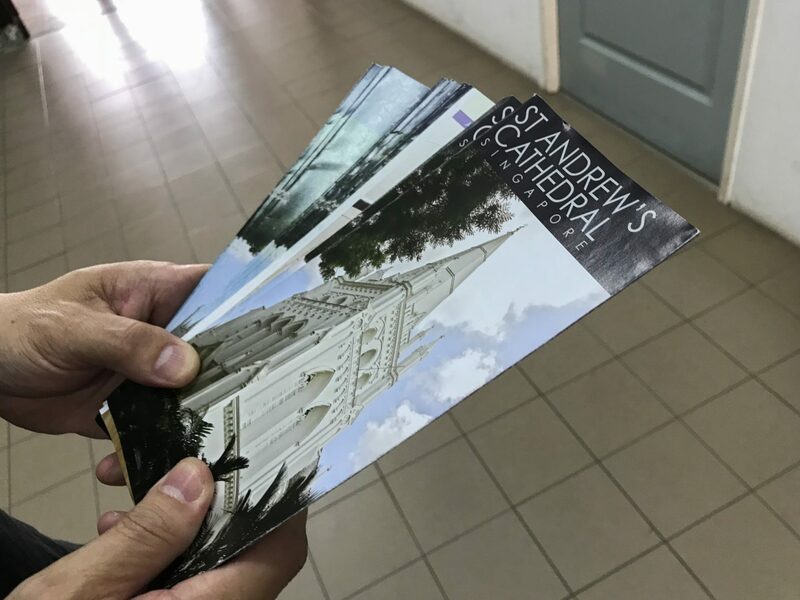 Joseph Soh is St Andrew's Cathedral's unofficial resident evangelist, sharing the Gospel with visitors in his role as a volunteer cathedral guide. Photo by Rachel Phua. It’s the second conversion Joseph Soh has witnessed today. A young Singaporean has just asked to become a Christian after stepping into St Andrew’s Cathedral an hour earlier. Years of reflection had gone into the decision. She sought the love and acceptance she never received, she says, which Jesus has freely given. 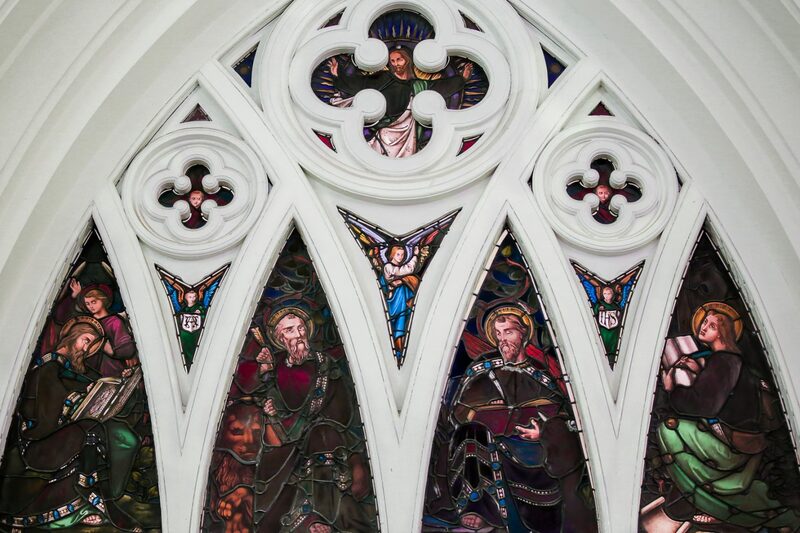 Inside the cathedral nave, she closes her eyes and repeats the Sinner’s Prayer after the pastor sitting next to her. She opens her eyes. The air remains still. But above, the angels are rejoicing. Soh, who is the Cathedral’s unofficial resident evangelist, is describing his style of sharing the Gospel. Unlike the stereotype of the fiery evangelist onstage and in the streets, the 56-year-old is average-sized, soft-spoken, stoic to a fault. No photos of me please, he insists, thoroughly afraid the story puts him on a pedestal above God – “I’m just here to follow my calling”. He is also meticulous. Soh keeps a record of the number of people he talks to daily. Since joining the Cathedral as a volunteer in July 29, 2013, Soh has spoken to 1,659 people about Christ, according to his journal. Soh does a yearly report on the status of the people to whom he has evangelised. Photo courtesy of Joseph Soh. Out of that figure, some 10% are Christians today, he says. About 80% of the people he speaks to are from China, most of them tourists visiting the cathedral heritage site. The rest come from the likes of Taiwan, Japan and Malaysia. He approaches the occasional Singaporean seeking solace too. Soh chooses not to recount testimonies because he does not want to encourage his listener to expect the same miracle to happen to him/her (there are tracts containing testimonies for visitors to pick up in the public areas). Neither does he want the stories to give an emotional high without offering the fundamental truth. Soh started out as a volunteer cathedral guide, after asking God for a place where he could reach out to more people. He was doing similar work at his church among the heartlanders for nine years, but it was tough to find people who were willing and available to talk in the afternoon, he says. Tracts are available to visitors in the public areas of St Andrews Cathedral. Photo by Rachel Phua. Then, in May 2013, Soh was at the cathedral for a meeting when, during a break, he saw a tourist from China and felt the urge to share about Christianity. 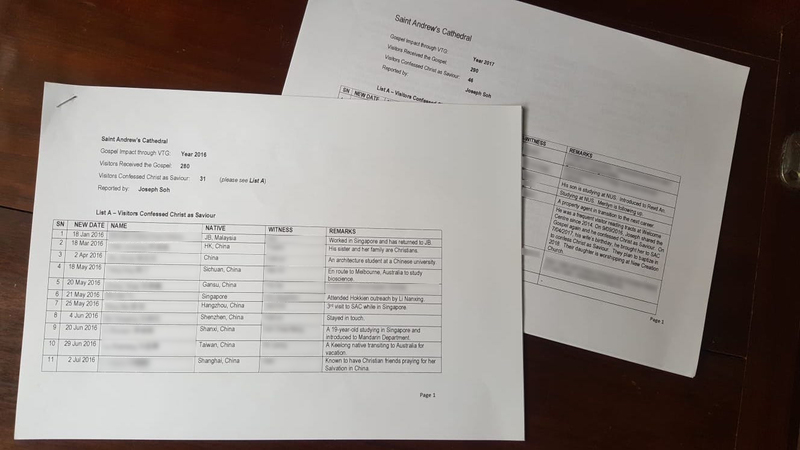 The following week, his cousin – who volunteers at the cathedral welcome centre – told him that the church was looking for Mandarin-speaking guides, and Soh successfully applied for the position. The staff had no qualms with his evangelistic cause, he says. At first, Soh would go up to the visitors and ask if they wanted a tour of the premises. He would then share with them the history of the church, Singapore and with their permission, the faith. 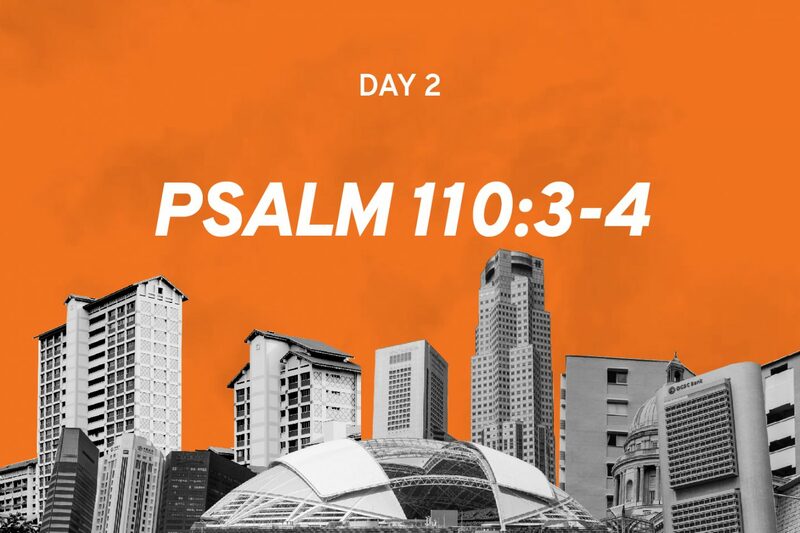 But he spent between 45 minutes and three hours walking around during each sharing, and found this evangelism method too tiring and unproductive. 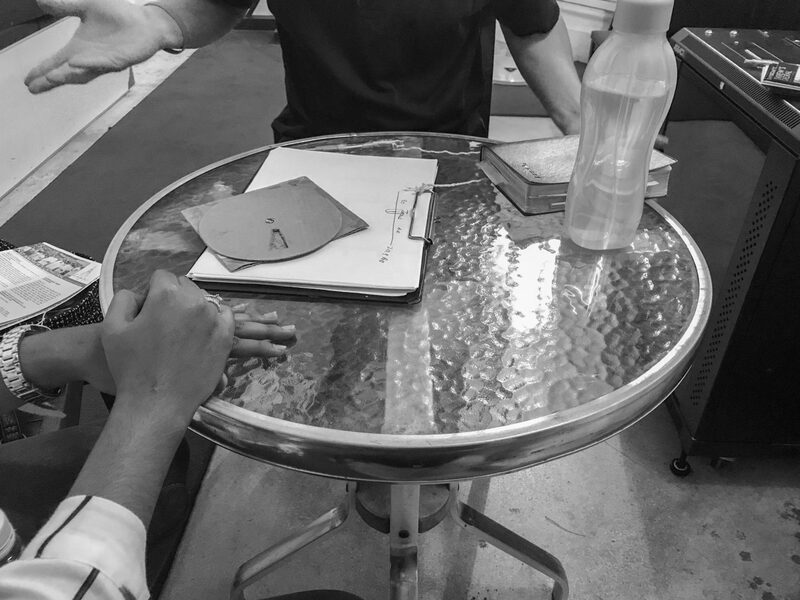 As time went by, Soh left the chaperone duties to the other volunteers, while he focused on approaching visitors directly, asking them if they would like to hear about the Christian faith. He still helps out with giving tours if a pair of extra hands is needed. He breaks the ice with visitors by handing out tourist brochures. Photo by Rachel Phua. Each session lasts for between 45 minutes and two hours, depending on the questions he fields after his presentation. He addresses four to five individuals or two to three groups a day, he says. During the conversations at a quiet corner of the cathedral, Soh introduces his small audience to the concept of creation, the fall, the resurrection, the forgiveness of sins, and man’s purpose on earth – to have a relationship with God. Death is another topic he broaches. Soh explains that humans often live as if they were immortal, especially as the general life expectancy is at its highest in history. Yet, death is inevitable. All science and technology can do is prolong lives, not immortalise the living. And after death comes judgment – only those whose names are written in the book of life will live in paradise (Revelation 20:15, Luke 23:43). The rest will face hell. Most visitors accept the details without flinching, Soh says. Those who do not accept Christ immediately usually tell him they will think about the message. Virtually all say they will take a look at the Bible, he says. With their approval, Soh sends them a verse each week via WeChat or WhatsApp. Before the foreigners take their leave, he prays for them, that God would bless them, open their hearts to know Him, bring Christian friends to them, have a wonderful journey in Singapore and a safe trip going home. “I’m just here to sow the seeds that will hopefully grow,” he says. And some seeds have sprouted. Soh says there are visitors who come back a few years later to give him the good news. He remembers one woman from China whom he shared with in 2016. She told him at that time it was hard for her to renounce her then-religion, but two years later, she returned and revealed that she was baptised and serving in the choir ministry. A man from China who had accepted Christ after Soh shared with him in 2016 brought his mother to the cathedral in January the following year, hoping Soh could describe the Good News to her as well. They missed each other as Soh was not on duty that day, but the man later disclosed that his mum decided to convert, and she even returned her paraphernalia to the religious group she had previously belonged to. Soh sharing the Gospel with a Singaporean woman who decided to become a Christian. Photo by Rachel Phua. 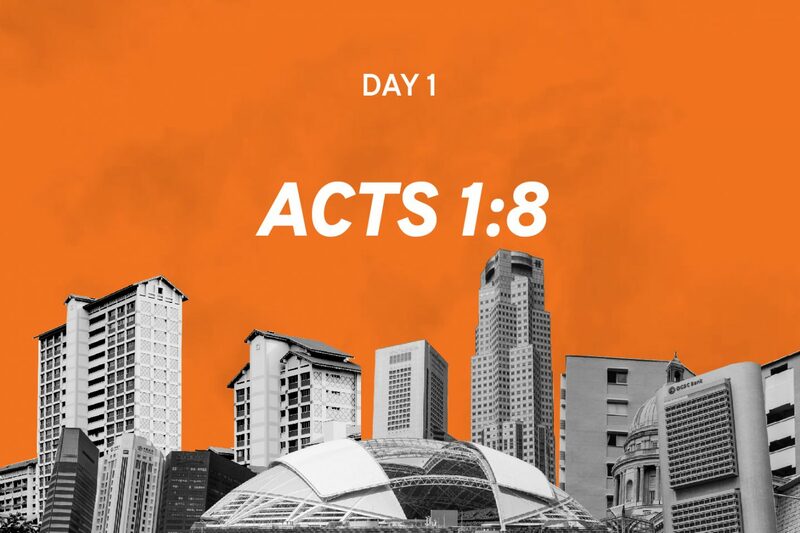 Soh says there is an urgent need to share the Gospel with the foreigners who come to Singapore because some of them may never have the opportunity to hear it back home. Being tourists, they may also be more relaxed, and therefore more open to hearing the Word. Soh tries to connect his new friends with each other. 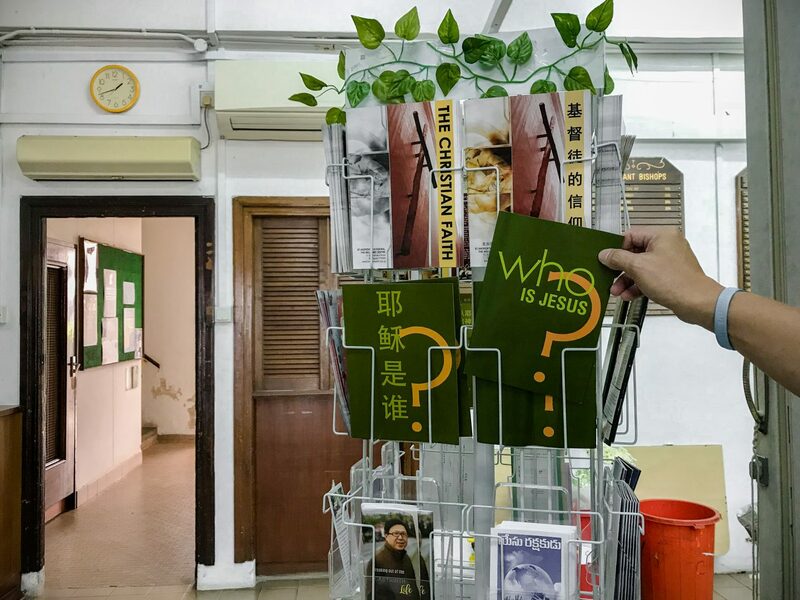 When a foreigner receives Christ, Soh tries to find another Christian living in their district to link them up. If they are local, he either contacts a church near their home or fetches a cathedral staff member to invite them to the services at St Andrews Cathedral. When he left his career in stockbroking, Soh turned to full-time volunteer work with the various churches he has been helping since 2002. He rejoined the business for a period between 2007 and 2012. He has no salary, instead living on “savings and endowments”. Neither does he have a seminary degree. But Soh knows he has been called by God to evangelise – not through a special celestial voice, but because of God’s commission to us (Matthew 28:19). With that, Soh returns to the cathedral’s grounds, brochures in hand, ready to share the Good News (1 Peter 3:15). Ask Salt&Light: What should I do now that I'm retrenched? Let’s talk over sambal belacan: Pray, tell, do you believe in God?